his career. His team-mate Nico Rosberg ends the season as runner-up. Between them, Hamilton and Rosberg accumulated 16 wins, 18 pole positions, 12 fastest laps and 31 podium finishes. With eleven one-two wins in a single season, the team surpassed the previous record set by McLaren in 1988. The 16th victory of the season in the Abu Dhabi Grand Prix means that Mercedes AMG Petronas no longer share the record with any other team for the highest number of wins in one season. "Congratulations to the new Formula 1 world champion Lewis Hamilton," said Dr. Dieter Zetsche, Chairman of the Board of Management of Daimler AG and Head of Mercedes-Benz Cars. "He has truly earned that title with a fantastic performance this year. At the same time, I would also like to congratulate his team-mate Nico Rosberg and all of our staff in Brackley, Brixworth and Stuttgart on this fascinating and highly successful season. Formula 1 is a team sport, and they have all achieved a magnificent result from their joint efforts this year. The fact is that world champions drive Mercedes-Benz. 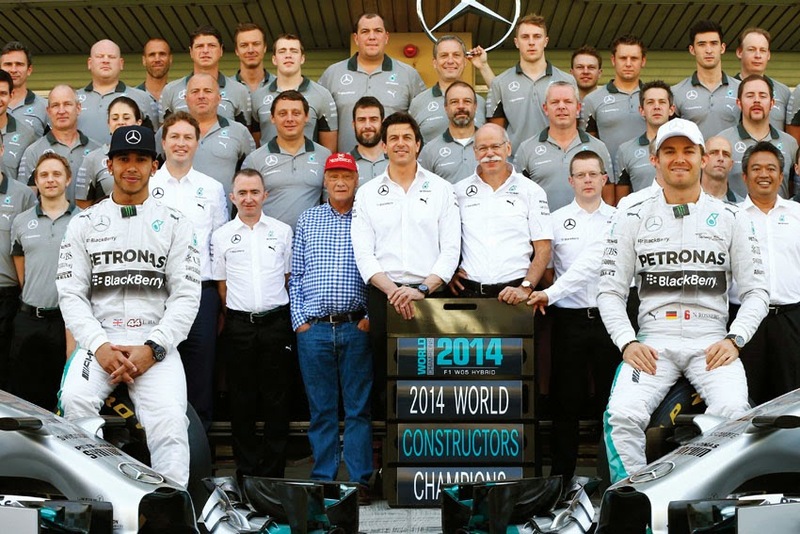 Motorsport has a long tradition at Mercedes-Benz. The very first Mercedes in 1901 was a racing car. Ever since the invention of the first automobile by Karl Benz, our company has been a force for innovation in the automotive industry. Right from the start, Mercedes-Benz regarded racing as a proving ground for some of our most important developments. The new Formula 1 regulations on hybrid power units has taken the sport in the same direction that the automotive industry was already heading. Formula 1 is carrying out pioneering work in areas that will also be of great importance in the car industry of the future."